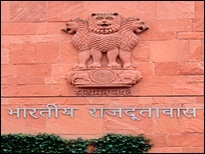 27 Apr : A Second Secretary-level woman diplomat working in the Indian High Commission in Islamabad has been arrested in New Delhi for allegedly passing on information to Pakistani intelligence agencies. Simultaneously, the station head of Research and Analysis Wing (RAW) in Islamabad R K Sharma has also come under the scanner, official sources said. A promotee officer of Ministry of External Affairs, 53-year-old Madhuri Gupta, was arrested here four days back after she was summoned to Delhi on the pretext of discussions on the current SAARC summit meeting held in Thimpu, Bhutan, the sources said. The officer, a Second Secretary working in the Mission for nearly three years, is alleged to have been passing on information from the Mission to her contacts in ISI till her movements came under surveillance of Intelligence Bureau sleuths. Home Secretary G K Pillai said Gupta had been passing information to Pakistani agencies. Sir, Very strict action should be taken against the Officer, this is very serious matter for our Security.